Zimmerman Skyrat, 1980. Mixed media (banana stickers on an old sheet of notebook paper). 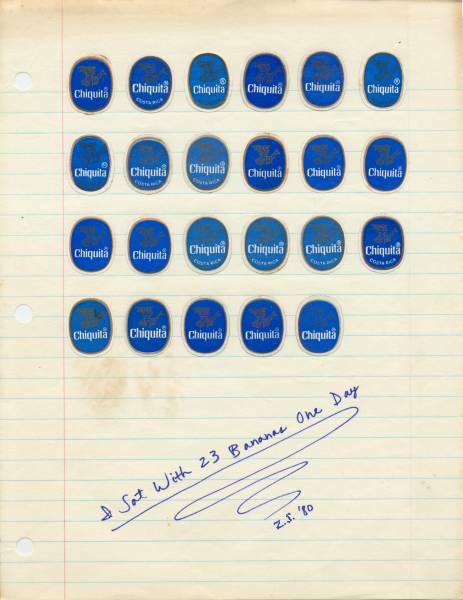 Original idea ripped off from Richard Hungerford's infamous Heineken beer piece, "I Sat With 23 Bottles One Day." Bananas are the world's best-selling fruit. In the United States alone, more than eleven billion bananas are eaten each year. (That's approximately 37 bananas per person.) The longest banana split ever made, certified by the Guiness Book of World Records, was over 4½ miles long. It was made on April 30, 1988 by the residents of Selinsgrove, Pennsylvania. No word on who helped them eat it.